On Tuesday, during a lull in class, Tyler was staring at the ceiling. 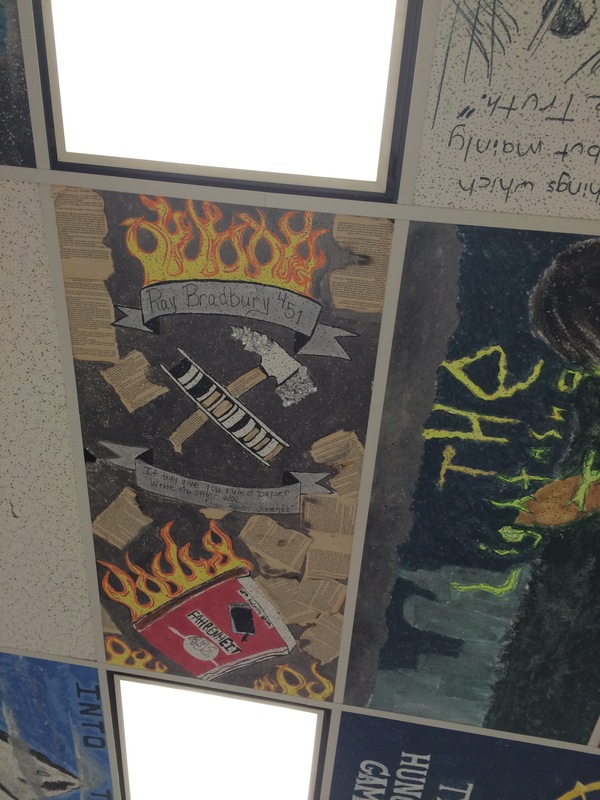 This isn’t unusual, or even discouraged, as our ceiling is covered with tiles that represent books. “That’s Fahrenheit 451, by Ray Bradbury,” I replied. I know that Tyler is a volunteer for our fire department. I also know that he hasn’t had a lot of positive experiences with reading, so I tailored my impromptu booktalk to my knowledge of him specifically. “That’s messed up!” Tyler said, eyebrows raised. “The hound goes after him, don’t he?” Tyler predicts. Then, he asks the best question: “Do you have that book?” We cross to the bookshelf and I thank the gods–it’s there. I give it to him, and he starts reading right away. Tyler has abandoned a lot of books, but I think he’ll finish this one. This was a case of matching the right book with the right reader at the right time, as Teri Lesesne says. Tyler wants to read this book, despite its difficulty–he has reading strategies to cope with the challenges in vocabulary, sentence structure, and chronology that he’ll encounter. I have faith that he will employ those strategies and grow as a reader and a thinker, as I have seen many a student do before, with greats like The Poisonwood Bible, Their Eyes Were Watching God, Pride and Prejudice, and Brave New World. We don’t need every single student to read all of those books. They are gorgeous works of art that I hope everyone will discover, but thinking the only way to expose students to those books is to make everyone read them isn’t the way to do that. Our student readers will find the classics on their own, if we give them the tools and the hunger to do so. 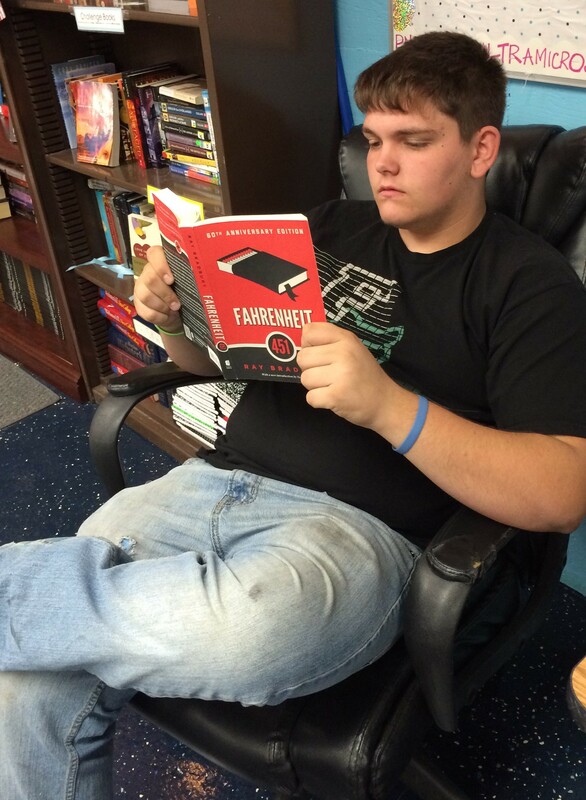 Tyler has the tools, and the hunger, so he found Fahrenheit–all because of a simple desire to know more, to find out why firemen would act so radically, sparked by the depiction of a flame on our classroom’s ceiling. How do you match your readers with classic texts? I love F451 so so much ❤ So happy he found Bradbury! Gorgeous ceiling tiles! Thanks, Shana, for this great story and excellent question. Another way into a challenging classic is through a shorter or less-challenging classic by the same author. Many of those revered authors have more accessible books that can be used as gateways. Of Mice and Men can lead to East of Eden. Tom Sawyer –> Huckleberry Finn. Being There –> The Painted Bird. A Christmas Carol –> other Dickens. The Old Man and the Sea –> The Sun Also Rises. It doesn’t work every time, but I’ve seen it work with those titles. Maybe a short story can be a similar rung on a ladder?